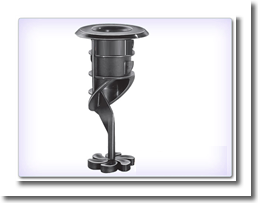 CASING :- Casing of tower is made of fiber glass/reinforced plastic. 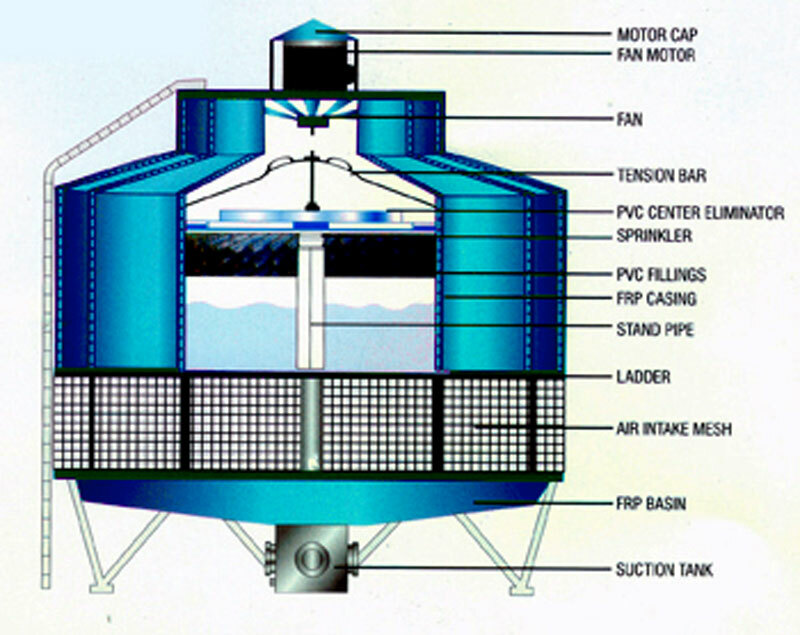 The cooling tower is designed and constructed for minimum maintenance and long life. You can operate in aggressive environment & resistant water born contaminats. P.V.C. FILL :- A pre-eminent quilaty and long life fill consists of modular block of PVC honey combs construction to create prolonged contact time of hot air with water for maximum heat transfer. The air pressure drop through the fill is negligible. SPRINKLER :- The uniform distribution of water over the honey combs fills this sprinkler, rotates by self propulsion and eliminates the need for atomising the water nozzles. 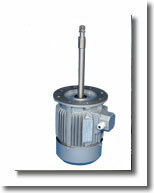 The head side includes ball bearing requiring minimum maintenance. MOTOR :- Electo Magnetic designs of the entire range of New India and Bharat Motor covered by 3N series have been developed in keeping with the Latest national and international practices and confirm in general to 1 EC recommendations. 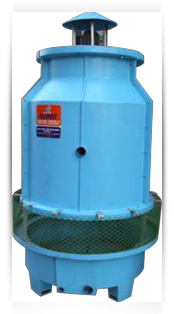 FAN :- An aero-dynamically designed axial flow type fan is a well balanced construction. The fan blades are of case aluminium alloy. 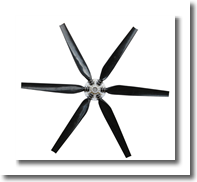 Fan with variable pitched blades is dynamically balanced for low vibration and high efficiency. 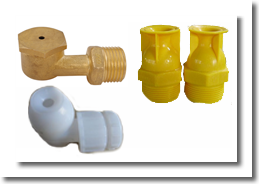 Nozzles :- Nozzles are constructed of Brass/Plastic Nylon used in cooling tower. The design ensures a fine water spray system. Air Conditioning Plants. Refrigeration System. Diesel Generating Sect. Air Compressor. Plastic Moulding Machine Heat Exchanger. Corrosion Free : To avoid corrosion on metal in water lines. Inspection Window : For Inspection of running position of sprinkler and fan blade. After sales service for all cooling tower is guaranteed to all users. Our service enigineers are available at any time to assist consulting engineer, tower owners and tower operators. Round shape cooling tower gives 100% cooling efficiencies it’s give good appearance flow rate from 5 M³/Hr To 550 M³/Hr gives differences in temperature 4ºC To30 ºC Availability of Capacities from 5 TR T0 600 TR. •	The casing and the design has an exclusive circular design. Therefore no impact of the direction of prevailing wind is encountered. •	The possibility of corrosion and rust gets minimized due to the framework steel components that are galvanized hot dip Though the cooling tower maintenance is not difficult, it is important. •	PVC Fill : A good quality fill and is of long life too. •	Drift Eliminator: The carry over losses due to moisture drops. •	Sprinkler: Due to the even water distribution over the honey comb fills.